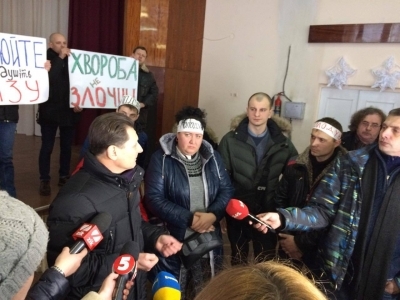 On 3 February in Kyiv in the morning three members of the primary trade union organization of the Free Trade Union of Railway Workers of Ukraine of Kurynivske trolleybus depot of Municipal Enterprise “Kyivpastrans” have started hunger strike. They demand to stop violation of labor rights and labor safety, illegal dismissal of three employees. Currently four trolleybus drivers are on hunger strike: the head of independent trade union of Kurynivska trolleybus depot KP “Kyivpastrans” Andrew Samko and trade union activists Tatyana Oleynik, Natalia Pristinska, Andriy Troyan. As it was informed previously, on April 2016 workers of the state-owned transport Municipal Enterprise “Kyivpastrans” organized the independent trade union. They wanted to fight against violations of safety standards in the Kurenivske trolleybus depot. The trade unionists informed, that the administration responded with a refusal to recognize the union, pressure, threats and intimidation of the members of the union, which is affiliated to the Confederation of Free Trade Unions of Ukraine (KVPU). “Just imagine: the drivers are forced to drive the trolleybus with old, “bald” tires. It is terrible to think what might happen when it’s snow and ice on roads. These four drivers organized the independent union because they wanted to work to rules and be sure that their rights won’t be violated. Instead, they were dismissed with egregious violations. Now they have to starve. By the way, administration gave them special room for protest. There are horrible conditions; the room is cold and dirty. Also administration is trying to evict Natalia from the hostel dormitory “.